Near the Uxmal ruins in Mexico’s Yucatan, the Choco-Story interactive chocolate museum and cacao plantation focuses on the history, culture, and sustainability of cacao growth in the area. It’s a community-driven, eco-friendly enterprise that makes for a unique and educational visit for the whole family. The exhibits at Choco-Story follow the history of cacao in this region, from its importance and use in the Maya culture to its economic impact and health properties. Visitors can view indigenous plants, watch chocolate demonstrations, and even take part in a Maya ceremony. The museum also explains the differences between dark, milk, and white chocolate. Near the end of the museum route is an interactive tasting. Some all-day tours combine a trip to the nearby ruins with a visit to the chocolate museum. Plan to spend one to two hours exploring Choco-Story. Created by a Belgian chocolate-business owner, the Choco-Story museum franchise has locations in Brussels, Paris, and Prague. The museum features an animal refuge with spider monkeys on-site. 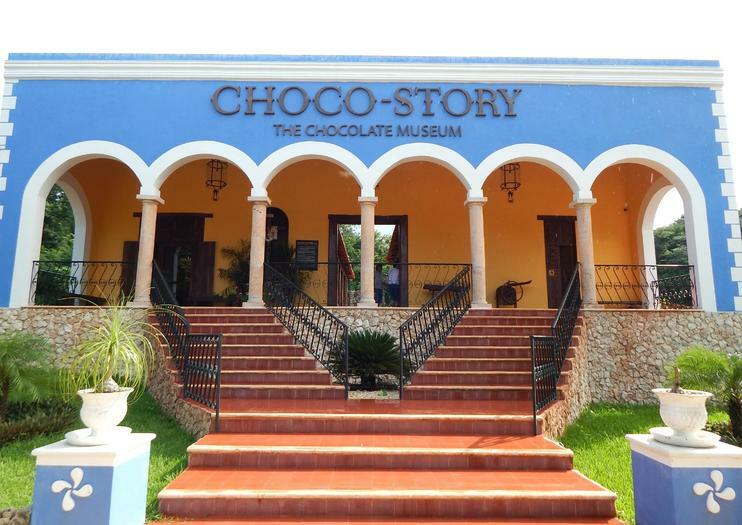 Choco-Story is located across the street from the entrance to the Uxmal ruins at kilometer 78 on the Campeche–Mérida road (Highway 261). You can also reach Uxmal from the TAME bus terminal in Mérida; buses depart throughout the day. Guided day trips from Mérida typically include hotel pickup and drop-off service. Choco-Story is a popular attraction, especially for travelers with children, so expect to encounter the most tourists during peak times, such as around the holidays. The Yucatan’s high season begins around Christmas and runs until Easter week. Overall the museum typically isn’t congested, and the Maya ceremony takes place every 20 minutes. Located directly across the highway from Choco-Story, Uxmal is the largest archaeological site along the Ruta Puuc, which is a 36-mile (58-kilometer) route that connects five Maya sites in the Yucatan. The name Uxmal (meaning “thrice-built”) is derived from its highest structure, the Pyramid of the Magician, which was constructed on top of existing pyramids. Take a day trip to Uxmal to learn about Mayan history and culture. Visit Choco Story, a sensory museum dedicated to cocoa, which the ancient Mayans called "drink of the gods." You will also spend time at an archaeological site to learn more about Uxmal's history as a center of power in ancient times. Enjoy a buffet lunch at a hacienda before heading back to Merida.